Me: "Hi, welcome to [store]! Anything I can do for you?" Customer: "I'm returning this game; it's not for me." Me: "What didn't you like about it?" Customer: "It was the stupidest game ever! I walked around a house for 10 minutes, went to the mall, then my kid died and the credits rolled and it was over!" Me: "Uh…those were the opening credits." You all know Heavy Rain, right? Interactive drama with a lot of freedom but where every action has an uncountable number of outcomes with far-reaching consequences? Heavy Rain is an interactive drama video game developed by Quantic Dream exclusively for the PlayStation 3. The game is written and directed by Quantic Dream's founder and CEO David Cage. 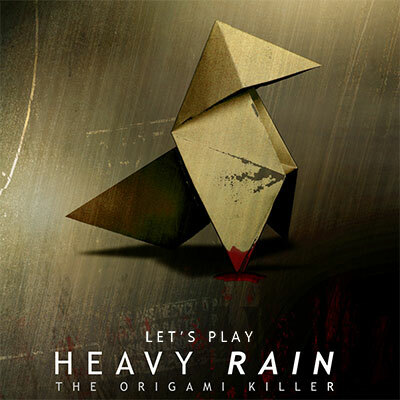 Heavy Rain's story is a dramatic thriller modeled after film noir, featuring four protagonists involved with the mystery of the Origami Killer, a serial killer who uses extended periods of rainfall to drown his victims. Ethan Mars is a father who is trying to save his son from being the next victim, while investigative journalist Madison Paige, FBI profiler Norman Jayden, and private detective Scott Shelby are each trying to track down clues to the Origami Killer's identity. It is the spiritual successor to Fahrenheit AKA Indigo Prophecy (my LP in the Let's Play Archives), an interesting but ultimately failed/succesful/absolutely insane attempt at a game entirely driven by its narrative. In the same vein, Heavy Rain is an awful pile of broken promises with a thin veneer of ridiculous pretension. In many ways the critical acclaim the game has received goes a long way to prove that the idea of "video games as art" as many would perceive it is downright laughable. The videos will primarily show a "succesful" run through the game, denoted by the "Heavy Rain" text up in the top right corner. Occasionally the video will cut to "Origami Killer", a failure run if you will, showing off alternate events, different ways of doing things, and divergent character portrayals. You'll get the hang of it eventually, just keep an eye out for the text in the top right when there's a "slash slide" cut. Some updates will come paired with appropriate Heavy Rain-related quotes from David Cage, other Quantic Dream spokespersons, or the "gaming press". Update 6 - The Shrink; The Park; Where's Shaun? Update 7 - Welcome, Norman!